This afternoon I screened High Noon, a film I had never seen before but that I suspected was one of the greatest westerns of all time based on reputation and its high ranking on the AFI list. Boy was I surprised. It’s not a western in the tradition of True Grit, 3:10 to Yuma or Butch Cassidy, but rather it’s a story about one man’s commitment to doing what he thinks is right despite what everyone else thinks and the fact that it takes place in the West is fairly irrelevant. I have to admit that I didn’t really care much for the film, but I was intrigued enough about why it was so critically acclaimed that I had to do some research and I found out some interesting things that changed my opinion — slightly. What makes the film even more interesting to me is that John Wayne hated it. In fact, he said it was the most un-American film ever made. Considering Wayne was a racist and someone who agreed with what HUAC was doing I guess that makes me a fan of High Noon. Lord knows I love a good liberal cause! Strangely, the film is listed as a favorite by both Bill Clinton and Dwight Eisenhower. High Noon was nominated for Best Picture but did not win. Cooper won for Best Actor, though in my mind he didn’t really do much so it must have been a bad year for actors! Len, I like High Noon a lot for the reasons you cited. 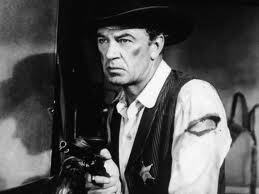 For the life of me, though, I’ve never understood the appeal of Gary Cooper. In any movie I’ve seen with him, he seems wooden and stilted. Maybe he’s an acquired taste, but I doubt that it’s one I’ll ever acquire. Thanks for the review.